My passion for secondhand clothing is a long-standing one. The obsession might've started off as a purely money-saving venture (as a teenager, I would set off, pocket money in hand, and hit the local charity shops, safe in the knowledge that I could bag twice as many pieces as I could in Topshop), but over time, it blossomed into a full-blown love affair. Fast-forward to 2019, and my tastes might be a little more refined and my bank balance a little less student-like, but my crush on all things vintage is still going strong. There's nothing more soul-restoring that having a break from high-street fashion (I still love you, don't worry) and diving headfirst into an eclectic rail of weird and wonderful pieces that hark back to a bygone era. I can leave with a one-of-a-kind item of clothing, knowing that I've helped "close the loop," even if in a small way. From various conversations over the years, it's become clear that many people find the idea of secondhand shopping slightly intimidating. Either you're a vintage shopper or you're not—there doesn't seem to be much middle ground. But if you can find the time, I'd really recommend giving it a go, as it's honestly one of the easiest (and funnest) ways to make your shopping habits more sustainable. And if nothing else, it'll save you a fair amount of money. If you're still feeling a little uncertain, let me give you a helping hand. I've picked 10 key trends for spring/summer 2019 and headed to a few of Covent Garden's finest vintage stores to show that you can, in fact, get new-season styles secondhand. 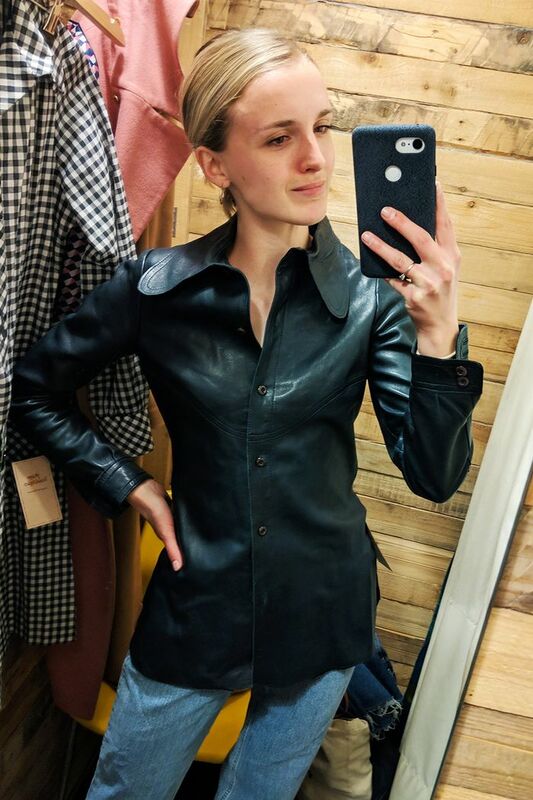 I've also included similar styles below, which I've handpicked from Rokit and Oxfam's online stores (perfect if you don't fancy braving the shops). Scroll down to see what I found. Style Notes: There have been so many cool new dress brands popping up over the last year or so, and a large number of them embracing modest silhouettes with long sleeves and high necklines cropping up everywhere. Whether it's a ruffled prairie dress or boho-print maxi, your local vintage store will be jam-packed with on-trend styles—perfect for summer weddings. Style Notes: French girls have been all over this trend, pairing their chunky Fair Isle and cable-knit cardis with high-waisted jeans. I found this blush-pink number in Rokit for a mere £15, and it will be a saving grace on chilly spring mornings. Style Notes: Gingham is the sort of print that never really goes out of style, which is lucky for us, as there's plenty of secondhand spring-ready styles around to whet our appetite. This monochromatic look is a little on the big side, but I often get secondhand pieces taken in, as they're often so cheap to begin with. Style Notes: I've been on the hunt for the perfect pair of knee-high boots for a while, and I may have just found them. Made from soft brown suede and featuring a platform heel, I'll wear these with everything from midi dresses to thigh-grazing miniskirts. Plus, they've already been worn in, so no blisters for me. Style Notes: Inspired by the bohemian styles of the '70s, sleeves have been given the super-sized treatment this season. This tropical-hued blouse is just too fun for words and is destined to be worn with jeans and heels for Friday night cocktails. Style Notes: Skinnies are having a bit of a break for 2019, and instead, '90s classic straight-leg jeans are enjoying a moment in the spotlight. You really can't go wrong with a pair of original Levi's 501s that'll will give you that authentic fit and serve you for many seasons to come. Style Notes: One of the best bargains of my trip was this '80s ruffle collar blouse, which was reduced from £20 down to £5 (aka the price of two coffees). Retro blouses are one of my favourite things to buy from vintage stores, as they're usually super affordable and often come in unusual prints that you'd never find on the high street. Style Notes: This is all I want to be wearing when summer hits. I love the square neckline (very 2019) and the boxy fit, which would also look fab over a white shirt. Great for when you need a little flower power in your life. 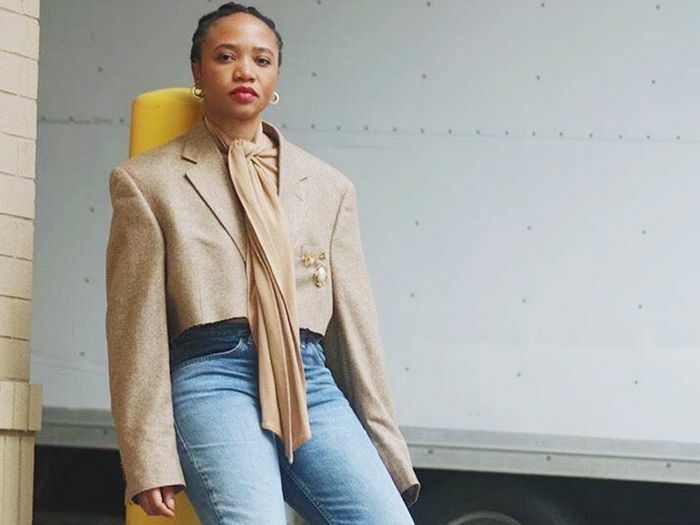 Style Notes: It felt like half of the showgoers at fashion week were wearing statement trench coats, and it's safe to say that secondhand stores have them coming out of their ears. Bag yourself a Burberry original (like the one I'm wearing in the above photo) and prepare to feel incredibly smug.